One of the latest terms that has popped up on the radar of health conscious people and parents alike has been “BPA free”. While knowing that BPA must be bad, many still don’t know the answer to the question: what does BPA free mean? It’s not a silly question at all. In fact, it is quite a complicated topic and new studies are constantly underway. Let’s start by looking at BPA itself. Bisphenol A, commonly called BPA, is a chemical that we’ve used in the production of plastics since the 1960’s. Nearly every plastic product contained BPA, including food and drink containers. Recently we learned that this chemical is actually absorbed from the container into our food, and therefore we have all inadvertently been consuming BPA for some time. Shockingly, estimates go as high as 95% of adult humans having BPA in their system at any given time. So, what does BPA free mean? It means finding ways to eat, contain, and store our food with materials other than plastic, or in the alternative, creating plastic products that do not contain the harmful chemical. What does BPA mean specifically with relation to infants and toddlers? BPA is an endocrine disruptor, which means it interferes with the production, secretion, function, and elimination of your natural hormones. Experts believe it can imitate our body’s own hormones, and interfere with the natural balance of things. This can be particularly detrimental to developing bodies, meaning babies and young children are especially sensitive to the effects of BPA. If you want to control and limit your child’s contact these substances, then buying non-toxic kid’s products is a great place to start. It’s important to note, however, that not every company marketing “organic” or “BPA free” products is actually selling safe stuff. In fact, studies have shown that many products that claim to be free of the chemical actually contain trace amounts of BPA – so make sure to do your homework before handing over your hard earned money. At Kangovou, we have created a line of dishware that is truly 100% free of BPA, PVC, Lead, Melamine, and Phthalate. Our products are made of quality food-grade, type 304, 18/8 stainless steel, which is naturally anti-bacterial and chemical free. Products like these won’t leach chemicals into food and beverages, so you can be sure your kids are getting real nutrition. Like all parents, you care about your child’s health and wellbeing above all else. 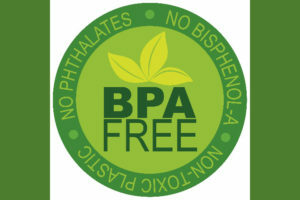 Making it a priority for them to have non-toxic, organic, BPA free products is an important step. Keep your eyes open at the store – if a kid’s product is not labeled as BPA free, it probably isn’t. At the end of the day, it’s your children’s safety that matters most, so take a minute to consider what you expose them to. Still asking yourself asking, “what does BPA free mean?” you can find more information and shop for awesome BPA free Kangovou products by clicking here.